Looking for the Theory course? View Yachtmaster Ocean Theory Course. The holder of a Yachtmaster Ocean Certificate is experienced and competent to skipper a yacht on passages of any length in all parts of the world. a shorebased test on your practical experience that results in an RYA/MCA Yachtmaster Ocean Certificate of Competence being awarded to those that pass. The RYA/MCA Yachtmaster Ocean Certificate of Competence is obtained by an oral and a written test. The candidate must provide the examiner with a narrative account of the planning and execution of the qualifying passage. This must include navigational records - completed on board a yacht on passage, out of sight of land, showing that the candidate have navigated the yacht without the use of electronic navigational aids. The records must include as a minimum: planning, reduction and plotting of a sun-run meridian altritude sight and a compass check carried out using the bearing of the sun, moon, a star or a planet. During the oral test the candidate may be required to answer questions on all aspects of ocean passage making in a yacht, including passage planning, navigation, worldwide meteorology, crew management and yacht preparation, maintenance and repairs. The written exam will include questions on sights and sight reduction and worldwide meteorology. Candidates who hold the Certificate of Satisfactory Completion of the RYA/MCA Yachtmaster Ocean Shorebased Course, A Royal Navy Ocean Navigation Certificate of a MCS Certificate of Competence as a Deck Officer will be exempt from the written exam. Hold an RYA/MCA Yachtmaster Offshore Certificate of Competence. The candidate was fully involved in the planning of the passage, including selection of the route, the navigational plan, checking the material condition of the yacht and her equipment, storing the spare gear, water and victual and organizing the watch-keeping routine. During the passage a minimum non-stop distance of 600 miles must have been run by the log, the yacht must have been at sea continuously for at least 96 hours and the yacht must have been more than 50 miles from land while sailing a distance of at least 200 miles. Qualifying passages for Yachtmaster Ocean and Offshore should be non stop by the shortest navigable route with no change of skipper. 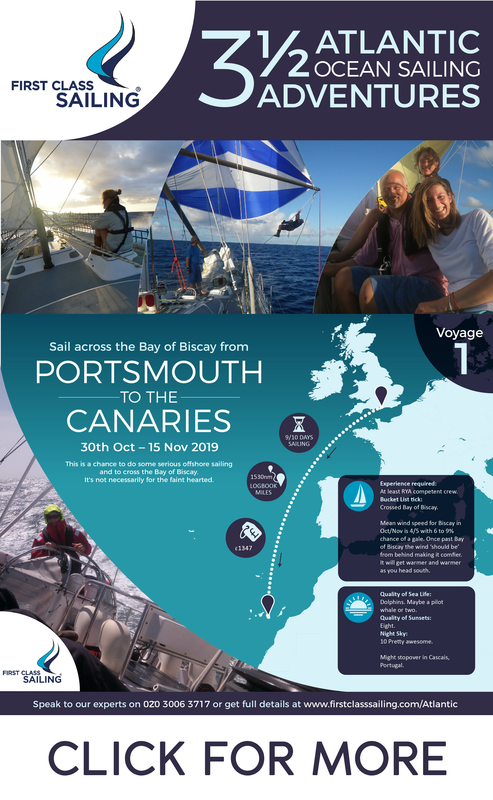 Passages such as recognised races which may not comply exactly with these requirements may be submitted to the RYA for approval before the voyage. For Ocean Passages, the following definition will apply: Throughout the passage the candidate must have acted in a responsible capacity either in sole charge of a watch or as a skipper. Ocean candidates may take their sights on a shorter passage than the qualifying Passage. The examiner will determine whether the candidate is competent at astro navigation. First Class Sailing hold Yachtmaster Ocean Shorebased courses periodically. If you need help finding a berth on a qualifying passage we may be able to help as we hear of delivery trips needing crew.